The prominent market players in the competitive market landscape of the global broadcast switchers market are now concentrating on developing 4K resolution broadcast switchers based on IP. The key players in the market are USA, LLC, Grass Valley, Ross Video, Snell Ltd., and Panasonic Corporation. These players collectively held 46% of overall market share in 2015. A remarkable trend among several key players is their effort towards providing services with respect to the arising demand in developing countries. Leading companies adapting this business dynamics and strategies are Sony Electronics Inc., Evertz Microsystems Ltd., and Panasonic Corporation among others. 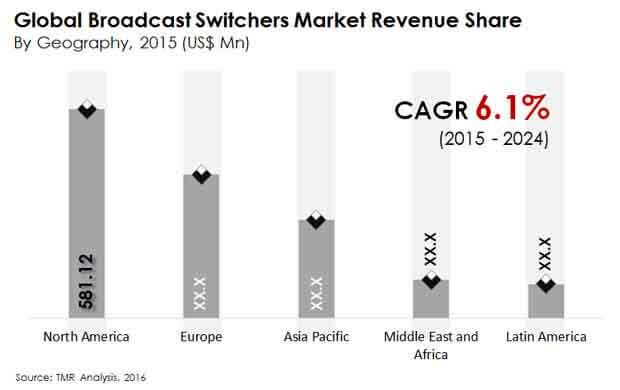 A future outlook of the global broadcast switchers market shows that the companies need to closely monitor the expanding demand from the developing nations where the rising popularity of the using multiscreen platform will propel the sales of 4K, HD, and IP based broadcast switchers. This substantial growth in demand for broadcast switchers is mainly down to the evolution of analog broadcasting to digital broadcasting. The strict ITU regulations along with the increasing awareness of the digital advancements in the broadcasting sector such as quick accessibility, myriad channels, and convenient storage are anticipated to drive the market growth. In addition to this, countries such as Brazil, Russia, Mexico, India, Africa, and Ukraine have made their transition from analog to digital broadcasting and thus contributing significantly to surge the adoption of broadcast switchers in the coming years. Broadcast switchers require huge investments in equipment which can pose a significant hindrance in the overall market growth. Expensive nature of creating a sound infrastructure with camera control units, light equipment cables, encoders, convertors, and on-field audio recorders will possibly create a major barrier in the development of broadcast switchers market. This rising investment cost on equipment will have an adverse effect on the medium to small-sized businesses. Moreover, cross-platform accessibility of television is also posing a threat in widespread adoption of broadcast switchers across the world. Numerous countries are now transitioning from analog to digital broadcasting. This transition offers a significant boost to growth opportunities across the broadcast switchers market. This expanding trend switch to digital content in wide untapped markets of developing regions are expected to contribute considerably to the development of the global broadcast switchers market in the coming years. The developing regions are expected to surpass the share of developed economies such as Japan, the U.S. and Western Europe during the forecast period. Moreover, changing television viewing preferences are also expected to create new growth opportunities for broadcast switchers. For instance, there has been a great demand for HD channels, particularly for watching sports, that has led to huge requirement for technological advancements in broadcast switchers.